Q-absorb is a completely natural proliposome lipid-soluble delivery system clinically shown in humans to increase Co-Q10 levels up to 400% (3.2x) over baseline and is 3–4 times better absorbed than chewable Co-Q10 tablets. Co-Q10 supports heart function as a component of the electron transport system, needed for ATP (i.e., energy) production within the cells, and as an antioxidant protects mitochondrial membranes and cholesterol from oxidation. Q-absorb is a completely natural proliposome lipid-soluble delivery system clinically shown in humans to increase Co-Q10 levels up to 400% (3.2x)over baseline and is 3–4 times better absorbed than chewable Co-Q10 tablets. Co-Q10 supports heart function as a component of the electron transport system, needed for ATP (i.e., energy) production within the cells, and as an antioxidant protects mitochondrial membranes and cholesterol from oxidation. 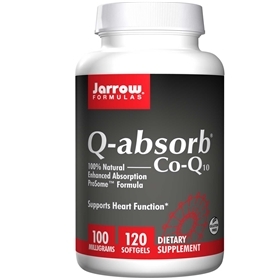 Jarrow FORMULAS Q-absorb restores Co-Q10 levels reduced or depleted by the use of statins. Jarrow FORMULAS Co-Q10 is derived from fermentation and consists only of the natural trans configuration, the sameas is synthesized in the human body. Jarrow FORMULAS supports clinical research on Coenzyme Q10. by your qualified health care consultant. Soy lecithin, medium chain glycerides (MCGs) and gamma tocopherol. Softgel consists of gelatin, glycerin and water. Carob extract (added as a light barrier).